Essential to your stores, our Sieve has been designed to offer reliable service. It has been manufactured primarily from durable stainless steel that promises not to rust or crumble over time. The black soft grip handle is comfortable within your grip while supporting the sieve during extended use. 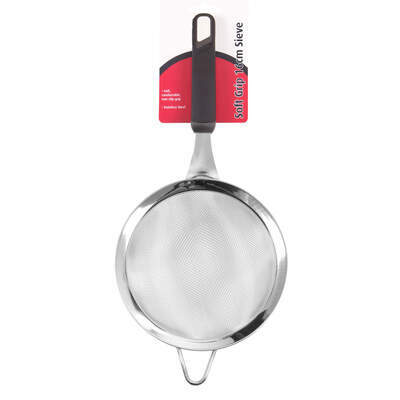 Suitable for dishwasher use, it helps to effectively sieve out lumps of flour or separate out other dry ingredients before use in your cooking. The next time you decide to try your hand at baking, consider either our Professional Oven Glove or our Baking Parchment 450mm x 50m.